The Douglas AC-47 Spooky (also nicknamed "Puff, the Magic Dragon") was the first in a series of gunships developed by the United States Air Force during the Vietnam War. It was designed to provide more firepower than light and medium ground-attack aircraft in certain situations when ground forces called for close air support. The AC-47 was a United States Air Force C-47, (the military version of the DC-3) that had been modified by mounting three 7.62 mm General Electric miniguns to fire through two rear window openings and the side cargo door, all on the left (pilot's) side of the aircraft, to provide close air support for ground troops. Other armament configurations could also be found on similar C-47-based aircraft around the world. The guns were actuated by a control on the pilot's yoke whereby he could control the guns either individually or together, although gunners were also among the crew to assist with gun failures and similar issues. It could orbit the target for hours, providing suppressing fire over an elliptical area approximately 52 yd (47.5 m) in diameter, placing a round every 2.4 yd (2.2 m) during a three-second burst. The aircraft also carried flares it could drop to illuminate the battleground. The AC-47 had no previous design to gauge how successful it would be, because it was the first of its kind. The USAF found itself in a precarious situation when requests for additional gunships began to come in because it simply lacked miniguns to fit additional aircraft after the first two conversions. The next four aircraft were equipped with ten .30 caliber AN/M2 machine guns. These weapons, using World War II and Korean War ammunition stocks, were quickly discovered to jam easily, produce large amounts of gases from firing, and, even in ten-gun groups, only provide the density of fire of a single minigun. All four of these aircraft were retrofitted to the standard armament configuration when additional miniguns arrived. The AC-47 initially used SUU-11/A gun pods that were installed on locally fabricated mounts for the gunship application. Emerson Electric eventually developed the MXU-470/A to replace the gun pods, which were also used on later gunships. In August 1964, years of fixed-wing gunship experimentation reached a new peak with Project Tailchaser under the direction of Capt. John C. Simons. This test involved the conversion of a single Convair C-131B to be capable of firing a single GAU-2/A Minigun at a downward angle out of the left side of the aircraft. Even crude grease pencil crosshairs were quickly discovered to enable a pilot flying in a pylon turn to hit a stationary area target with relative accuracy and ease. The Armament Development and Test Center tested the craft at Eglin Air Force Base, Florida, but lack of funding soon suspended the tests. In 1964, Capt. Ron W. Terry returned from temporary duty in Vietnam as part of an Air Force Systems Command team reviewing all aspects of air operations in counter-insurgency warfare, where he had noted the usefulness of C-47s and C-123s orbiting as flare ships during night attacks on fortified hamlets. He received permission to conduct a live-fire test using the C-131 and revived the side-firing gunship program. By October, Capt. Terry's team under Project Gunship provided a C-47D, which was converted to a similar standard as the Project Tailchaser aircraft and armed with three miniguns, which were initially mounted on locally fabricated mounts—essentially strapped gun pods intended for fixed-wing aircraft (SUU-11/A) onto a mount allowing them to be fired remotely out the port side. Captain Terry and a testing team arrived at Bien Hoa Air Base, South Vietnam, on 2 December 1964, with equipment needed to modify two C-47s. The first test aircraft (43-48579, a C-47B-5-DK mail courier converted to C-47D standard by removal of its superchargers) was ready by 11 December, the second by 15 December, and both were allocated to the 1st Air Commando Squadron for combat testing. The newly dubbed "FC-47" often operated under the radio call sign "Puff". Its primary mission involved protecting villages, hamlets, and personnel from mass attacks by VC guerrilla units. Puff's first significant success occurred on the night of 23–24 December 1964. An FC-47 arrived over the Special Forces outpost at Tranh Yend in the Mekong Delta just 37 minutes after an air support request, fired 4,500 rounds of ammunition, and broke the Viet Cong attack. The FC-47 was then called to support a second outpost at Trung Hung, about 20 miles (32 km) away. The aircraft again blunted the VC attack and forced a retreat. Between 15 and 26 December, all the FC-47's 16 combat sorties were successful. On 8 February 1965, an FC-47 flying over the Bong Son area of Vietnam’s Central Highlands demonstrated its capabilities in the process of blunting a Viet Cong offensive. For over four hours, it fired 20,500 rounds into a Viet Cong hilltop position, killing an estimated 300 Viet Cong troops. The early gunship trials were so successful, the second aircraft was returned to the United States early in 1965 to provide crew training. In July 1965, Headquarters USAF ordered TAC to establish an AC-47 squadron. By November 1965, a total of five aircraft were operating with the 4th Air Commando Squadron, activated in August as the first operational unit, and by the end of 1965, a total of 26 had been converted. Training Detachment 8, 1st Air Commando Wing, was subsequently established at Forbes AFB, Kansas. In Operation Big Shoot, the 4th ACS in Vietnam grew to 20 AC-47s (16 aircraft plus four reserves for attrition). The 4th ACS deployed to Tan Son Nhut Air Base, Vietnam, on 14 November 1965. Now using the call sign "Spooky", each of its three 7.62 mm miniguns could selectively fire either 50 or 100 rounds per second. Cruising in an overhead left-hand orbit at 120 knots air speed at an altitude of 3,000 feet (910 m), the gunship could put a bullet or glowing red tracer (every fifth round) bullet into every square yard of a football field-sized target in potentially less than 10 seconds. And, as long as its 45-flare and 24,000-round basic load of ammunition held out, it could do this intermittently while loitering over the target for hours. In May 1966, the squadron moved north to Nha Trang Air Base to join the newly activated 14th Air Commando Wing. The 3rd Air Commando Squadron was activated at Nha Trang on 5 April 1968 as a second AC-47 squadron, with both squadrons redesignated as Special Operations Squadrons on 1 August 1968. Flights of both squadrons were stationed at bases throughout South Vietnam, and one flight of the 4th SOS served at Udorn Royal Thai Air Force Base with the 432nd Tactical Reconnaissance Wing. The superb work of the two AC-47 squadrons, each with 16 AC-47s flown by aircrews younger than the aircraft they flew, was undoubtedly a key contributor to the award of the Presidential Unit Citation to the 14th Air Commando Wing in June 1968. One of the most publicized battles of the Vietnam War was the siege of Khe Sanh in early 1968, known as "Operation Niagara". More than 24,000 tactical and 2,700 B-52 strikes dropped 110,000 tons of ordnance in attacks that averaged over 300 sorties per day. During the two and a half months of combat in that tiny area, fighters were in the air day and night. At night, AC-47 gunships kept up a constant chatter of fire against enemy troops. During darkness, AC-47 gunships provided illumination against enemy troops. The AC-47D gunship should not be confused with a small number of C-47s which were fitted with electronic equipment in the 1950s. Prior to 1962, these aircraft were designated AC-47D. When a new designation system was adopted in 1962, these became EC-47Ds. The original gunships had been designated FC-47D by the United States Air Force, but with protests from fighter pilots, this designation was changed to AC-47D during 1965. Of the 53 aircraft converted to AC-47 configuration, 41 served in Vietnam and 19 were lost to all causes, 12 in combat. Combat reports indicate that no village or hamlet under Spooky Squadron protection was ever lost, and a plethora of reports from civilians and military personnel were made about AC-47s coming to the rescue and saving their lives. 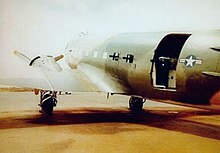 As the United States began Project Gunship II and Project Gunship III, many of the remaining AC-47Ds were transferred to the Republic of Vietnam Air Force, the Royal Lao Air Force, and to Cambodia's Khmer Air Force, after Prince Norodom Sihanouk was deposed in a coup by General Lon Nol. A1C John L. Levitow, an AC-47 loadmaster with the 3rd SOS, received the Medal of Honor for saving his aircraft, Spooky 71, from destruction on 24 February 1969 during a fire support mission at Long Binh. The aircraft was struck by an 82-mm mortar round that inflicted 3,500 shrapnel holes, wounding Levitow 40 times, but he used his body to jettison an armed magnesium flare, which ignited shortly after Levitow ejected it from the aircraft, allowing the AC-47 to return to base. In 2006, Colombia started operating retrofitted AC-47s, where they are known by civilians as avion fantasma (ghost plane). They are successfully operated by the Colombian Air Force in counter-insurgency operations in conjunction with AH-60 Arpia helicopters (an armed variant of the UH-60) and Cessna A-37 Dragonflys against local illegally armed groups. These are five Basler BT-67s purchased by Colombia with .50 cal (12.7 mm) GAU-19/A machine guns slaved to a forward looking infrared (or FLIR) system. They also have the ability to carry bombs. At least one has been seen fitted with one GAU-19/A and a 20 mm cannon, most likely a French made M621. The BT-67 is a variant of the C-47/DC-3 modified by the Basler Corporation of Oshkosh, Wisconsin. In 1970, the Indonesian Air Force converted a former civilian DC-3. The converted aircraft was armed with three .50 cal machine guns. During 1975, the Indonesian Air Force used its "AC-47" in the Indonesian invasion of East Timor to attack the city of Dili. Later, the aircraft was used in Indonesian military close air support missions in East Timor. A retirement date is unknown. North Vietnam captured several AC-47s in 1975 and is very likely that some of them may have seen actual combat in Cambodia. In December 1984 and January 1985, the United States supplied two AC-47D gunships to the El Salvador Air Force and trained aircrews to operate the system. The AC-47 gunship carried three .50 cal machine guns and could loiter and provide heavy firepower for army operations. As the FAS had long operated C-47s, it was easy for the United States to train pilots and crew to operate the aircraft as a weapons platform. By all accounts, the AC-47 soon became probably the most effective weapon in the FAS arsenal. Variants of the AC-47 based on various iterations of the airframe including the BT-67, have been used by various airforces including those of Laos, Cambodia, South Africa, El Salvador and Rhodesia. A variety of weapons configurations include Gatling guns of numerous types, various medium and heavy machine guns and larger autocannon (South African "Dragon Daks" were known to fit 20 mm cannons). The Republic of China Air Force (Taiwanese Air Force) also converted some of its C-47s to gunships. These machines were armed with M2 machine guns taken from retired F-86s. Colombian Air Force - Technically not a C-47 or AC-47, but a Basler BT-67 by Basler Turbo Conversions LLC. There are aircraft painted to represent AC-47s on static display at the Air Commando Park at Hurlburt Field and the Air Force Armament Museum at Eglin Air Force Base. These airframes never were AC-47s and were actually regular unarmed C-47s. ^ It can be seen in action here. ^ "AC-47 Factsheet". Archived from the original on 2014-10-11. ^ Hobson, Chris. Vietnam Air Losses, USAF/USN/USMC, Fixed-Wing Aircraft Losses in Southeast Asia 1961–1973. North Branch, Minnesota: Specialty Press, 2001. ISBN 1-85780-115-6. ^ "Colombia: Seguridad & Defensa." fuerzasmilitares.net. Retrieved: 12 December 2011. ^ "The Only World War II Aircraft Still In Service." Strategypage.com. Retrieved: 14 December 2012. ^ Corum, James S. and Johnson, Wray R. "Airpower in Small Wars: Fighting Insurgents and Terrorists" Kansas University Press: 2003. ISBN 0-7006-1239-4. p.337. ^ "Hurlburt Field Memorial Airpark Guide" (PDF). Hurlburt Field. Retrieved 19 October 2016. ^ "C-47K Skytrain". Air Force Armament Museum. Retrieved 19 October 2016. ^ "Old friends reunite at Hurlburt". Hurlburt Field. 28 November 2007. Retrieved 19 October 2016. ^ Campbell, Douglas E. (1 February 2012). BuNos! Disposition of World War II USN, USMC and USCG Aircraft Listed by Bureau Number. Lulu.com. p. 300. ISBN 9781105420719. Retrieved 19 October 2016. Corum, James S. and Johnson, Wray R. "Airpower in Small Wars: Fighting Insurgents and Terrorists" University Press of Kansas: 2003. ISBN 0-7006-1239-4. Gradidge, Jennifer M. The Douglas DC-1, DC-2, DC-3 – The First Seventy Years (two volumes). Tonbridge, UK: Air-Britain (Historians) Ltd., 2006. ISBN 0-85130-332-3. Project CHECO. Contemporary Historical Evaluation of Combat Operations: Fixed Wing Gunships in Southeast Asia, Retrieved: 22 November 2012. Wikimedia Commons has media related to Douglas AC-47 Spooky. USAF museum Douglas AC-47D "Spooky"
This page was last edited on 16 March 2019, at 22:13 (UTC).